Pivot variables are generally intended to be used in pivot tables. Specifically, when you create a pivot table, you can use pivot variables in selected parts of the query that defines the pivot table. 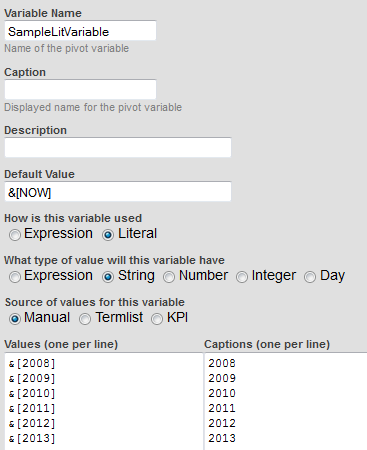 When a dashboard displays the pivot table, that dashboard can include a pivot variable control, with which the user can change the value of the corresponding pivot variable. DeepSee simply substitutes the given value into the query, executes the query, and then redisplays the pivot table. 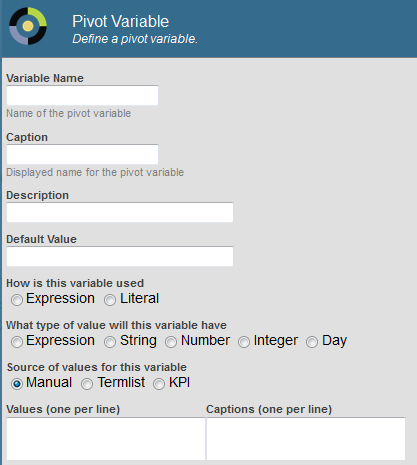 Similarly, when you access a dashboard via a URL, that URL can include parameters that specify the value for pivot variables used in pivot tables on the dashboard. Before displaying the dashboard, DeepSee substitutes the given value into the queries and executes the queries. 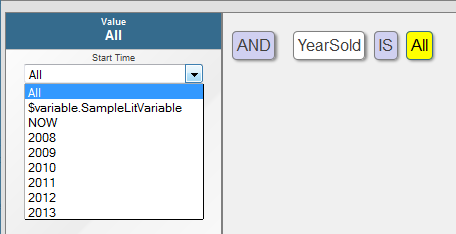 Default Value  Specify the default value. The best practice is to specify a default value so that DeepSee has a valid MDX query for any pivot table that uses this variable. For information on the kinds of values to provide, see Expression Pivot Variables and Literal Pivot Variables, later in this chapter. For details, see Expression Pivot Variables and Literal Pivot Variables, later in this chapter. Termlist  Select this to use a term list to provide the values. 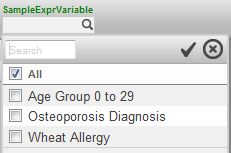 If you select this, click the Search button and then select a term list. 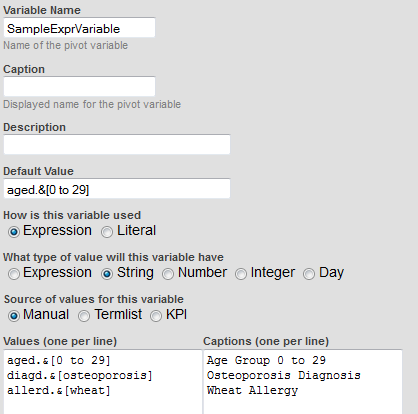 For each item in the term list, DeepSee uses the item value as the value and uses the item key as the corresponding caption. The pivot variable control displays your list of options. The KPI should have a property called Value. For each series in the KPI, DeepSee uses the Value property as the value and uses the series name as the corresponding caption. The pivot variable control displays your list of options. In all cases, for information on the kinds of values to provide, see Expression Pivot Variables and Literal Pivot Variables, later in this chapter. In the most useful scenario, the variable is intended to represent the last part of a member identifier, and you use it in the Advanced Filter Editor. In this scenario, any value for the variable should be a string of the form &[key] where key is a member key. For example: &[0 to 29]. (See Finding the Key for a Member, earlier in this book.) See the example later in this section.